Markings: The left side of the barrel is marked with a Volquartsen logo and “22 LR”. The left of the receiver is marked with the serial number, a Volquartsen logo and “Volquartsen Deluxe”. The right of the receiver is marked “Carroll, IA”. Barrel Length: The barrel length is approximately 16 1/2”, 18 3/4″ including the compensator. Sights / Optics: The top of the receiver has an integral Picatinny-style rail. There is no provision for iron sights. Stock Configuration & Condition: The stock is a one-piece green-gray laminate wood thumbhole stock with solid black rubber Volquartsen buttpad. The stock has only a few scattered light compressions. There are no chips or cracks. The LOP measures 13 3/4” from the front of the trigger to the back of the buttpad, which shows very light wear. The stock is in about Fine-Excellent condition. Overall Condition: This rifle retains about 98% of its metal finish. The optic rail has light wear from a previously installed mount and the bolt shows light operational wear. The screw heads are undamaged and the markings are clear. Overall, this rifle rates in Excellent condition. Mechanics: The action functions correctly. We did not fire this rifle. As with all used firearms, a thorough cleaning may be necessary to meet your maintenance standards. Box, Paperwork & Accessories: This rifle comes with a single 10-round Ruger 10/22 rotary magazine which has operational wear, in about Very Good-plus condition. Our Assessment: The Ruger 10/22 is a well-known rimfire semi-auto that has a huge following, and has spawned various aftermarket stocks, barrels and trigger assemblies that combined can easily exceed the purchase price of the rifle. 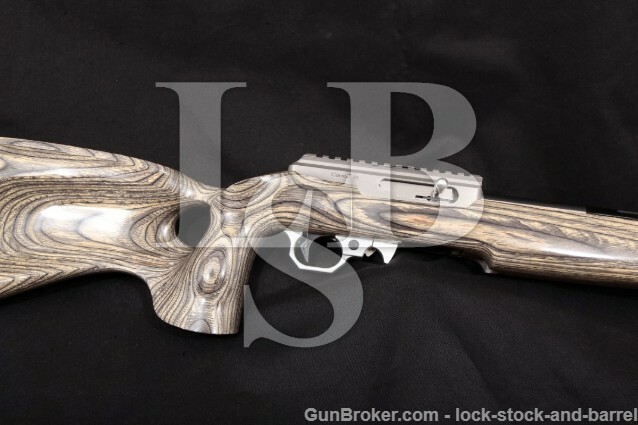 This rifle is an example of a factory-custom rifle from Volquartsen Customs Ltd., one of the best makers of Ruger 10/22 custom parts and accessories. It is in Excellent condition with about 99% of its finish remaining. The bore is bright with sharp rifling. The barrel is an aluminum THM tension bull barrel with Volquartsen’s I-fluting and a 16-hole muzzle brake which is threaded to the barrel with a barely visible seam. This promises to be a very accurate rifle and with its light weight and compensator, this should be qick-handling with little muzzle movement making it ideal for any sort of rapid-fire smallbore competition. Just add a scope or red-dot and you’ve got yourself a fine little plinker. Please see our photos and good luck! CA Legal or CA Private Party Transferable: This rifle can be transferred in California.